Hello!!!! I have missed you! It has been far too long since I sat down to write. So to usher my (fingers crossed) step back into normal posting, I thought I would keep it short and sweet. I haven’t posted in a recipe in a while so just because I like you so much, I thought I’d give you this gem! Legitimately this was so easy, so delicious and so fast, I may have forgotten to write down precise amounts, but no worries, no matter how you make it, it’s going to be delish! Note: Feel free to play with the ingredient amounts until you find the perfect combination for you! 2. Cut your butternut squash in half (scoop out the seeds) and then cut into quarters, placed on a baking sheet and bake for 30-45 minutes (or until soft). Once your squash is cooked, allow to cool. Then peel each piece and cut into thin, 1-2 inch pieces. 3. Coat a skillet with 1/2-1 tbsp olive oil. On medium-high heat, cook the onions until they are browned and somewhat translucent. My cast iron skillet heats up quickly so this took about 8-10 minutes. Just make sure to continuously stir them, so no one piece is overly cooked. Remove from heat and set aside. 4. Place the TJ’s Flatbread on a baking sheet, evenly spread 1 tbsp of olive oil over the dough (you can use a brush or the back of a spoon). I wanted to try out two different herbs, so I sprinkled the rosemary on one half of the flatbread and sage on the other half. 5. 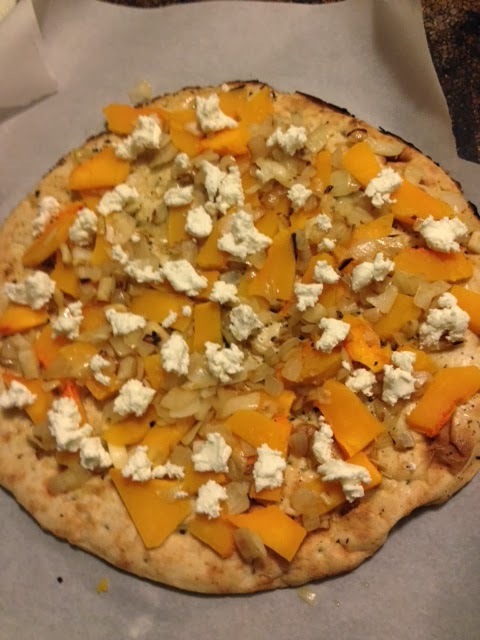 Create a layer of butter squash over the flatbread. 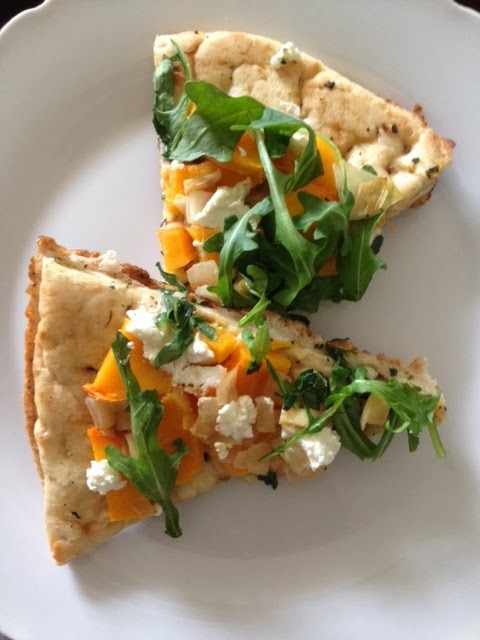 If you prefer you can mash the butternut squash and spread it over the flatbread like tomato sauce. Sprinkle the onions and goat cheese on top. 6. Turn oven up to 400°F and bake flatbread for 8-10 minutes. 7. 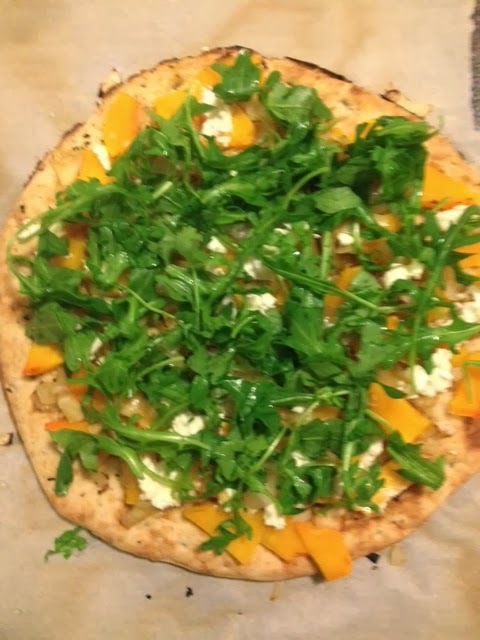 Remove from oven and top with arugula. Now you’re ready to eat a slice (or three) and they make great leftovers. Just remember to remove the arugula before reheating (it will wilt and that doesn’t always taste as great).